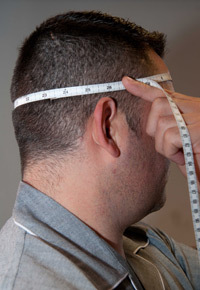 Using a measuring tape, measure the circumference of the head, pulling the tape tight beginning in the center of the forehead. Long hair should be put up while measuring to get a more accurate reading. The hair should be worn up during the study also, preventing the strap from slipping during the night. 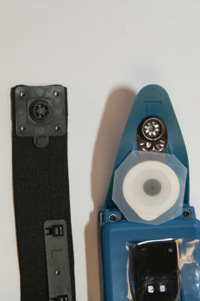 Adjust the strap to the appropriate setting and the setting number visible in the U shape notch on the top side of the strap. Thoroughly wash and dry your forehead. Remove the plastic covers from the electrodes. 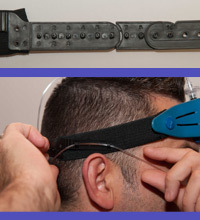 Place the ARES forehead sensor on the center of your forehead and gently pull the black strap to the back of your head. Remover hair from under the sensor. Adjust the slip tube to tighten the cannula. Make sure the cannula tips cannot be pulled more than ¼ inch away from the nose.